Eating more to gain weight is difficult if your cupboards are bare. Go to the grocery store to stock up on healthy, nutritious and calorie-dense foods. Shop the perimeter of your store and also include foods from the store's interior aisles, but fill your cart with foods that support healthy muscle gain, rather than foods that might create excess body fat. Even if you're underweight, you're still vulnerable to the perils of eating too much saturated fat in fatty cuts of meat and poultry skin. Focus on lean proteins such as chicken or turkey breast, flank steak, lean ground beef, tofu and fish. The unsaturated fats found in salmon and nuts are good sources of protein and calories, so add them to your cart. Beans, such as black beans, pinto and garbanzo beans, and lentils, are other calorie-dense sources of protein that do not have added saturated fat. Dairy foods are another source of quality calories that contain protein, plus calcium and vitamins D and A. 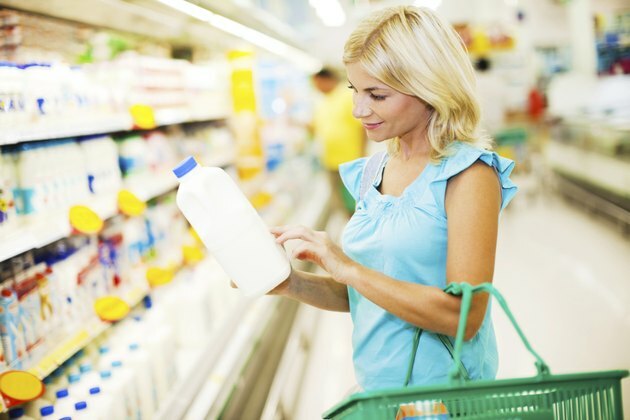 Plain milk, yogurt, cottage cheese, ricotta cheese and kefir are all good options for weight gain. When you're trying to gain weight to improve your health, eating full-fat versions of these products are fine. Remember, calories from added protein support weight-gain efforts at the gym. Protein provides amino acids, which supports the growth and repair of muscle fibers worked during resistance-training sessions. Don't banish all the fibrous vegetables from your cart, such as lettuce, spinach, broccoli and cauliflower, but emphasize starchy ones, which contain more calories per serving. Sweet potatoes and white potatoes as well as fresh or frozen corn and peas offer phytonutrients, antioxidants and fiber, and have more calories than fibrous veggies. For example, a large sweet potato contains 160 calories and has ample amounts of vitamins A and C; a cup of sweet corn kernals contains 134 calories and has B vitamins and fiber; and a cup of peas has 67 calories and lots of vitamins C and K. Compare this to the less-calorically dense but equally nutritious choices of raw spinach, with 7 calories per cup; raw romaine lettuce, with 8 calories per cup; or sliced radishes, with 19 calories per cup. Refined grains, such as white bread and pasta, have calories but offer little fiber for a healthy digestive tract. Any nutrients they have are added back during processing, which creates a refined, white grain that requires stripping the nutrient-dense portions away. Choose 100-percent, whole-wheat bagels, bread and pasta. The thicker-cut breads, such as pumpernickel and rye, will also have more calories and nutrients per serving than fluffy white bread. Hit the bulk bins for brown rice, quinoa and barley to sop up soups and braised meat dishes. Higher calorie fruits to emphasize include bananas, papaya and pineapple. You can add frozen versions of these fruits to smoothies, which may also include some whey protein, which is another good item for your basket. Look for versions that don't have a lot of added extra sugar or supplements. Dried fruit, such as raisins, dates and apricots, also pack a caloric punch and you can easily carry these as a snack when you're on the go. Other handy items to have in your pantry include honey for sweetening yogurt, kefir or smoothies and dried milk powder to add to casseroles, cereal and liquid milk. You should also have olive or avocado oil in your cart -- use them to dress salads, roast vegetables or toss with whole-wheat pasta before adding sauce.